Then, Benedict XVI refers to his beloved predecessor. Wojtyla was not ashamed to proclaim himself son of God. He was not ashamed to announce the Gospel. Karol Wojytla’s holiness is truly all compelled in his being for God without being ashamed. “When I first meet somebody, I pray for him”, Karol Wojtyla said. He chose to be a priest because – after the death of his mother, brother and father – God is his family. He wear priestly cloths in a country (the Poland under communist rule) where only being priest is seen as suspicious. When he becomes Pope, he has no fear to proclaim the Gospel, notwithstanding a Pontificate is full of difficulties and controversial facts. 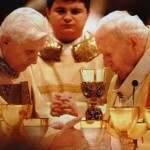 Many read, in Benedict XVI’s words, a sort of auto-absolution for the pedophilia scandal. But pedophilia of the clergy (and – in a wider perspective – the phenomenon of clerical abuses) is rooted more in-depth, according to the Pope. The problem is that the Christians are not a people of God anymore. Benedict XVI explained his point of view in a letter sent to the Church of Ireland after the scandal of Irish Church reached Rome. In that letter, he asked to Irish and world Church to begin an auto-purification path. Wojtyla’s call upon cannot be considered an auto-absolution. It is something different. Wojtyla is indicated as an example of how being a person of God. Wojtyla’s holiness indicates the path to be Church again. The debate for the 1st of May beatification never appeased. Many pointed the finger at the controversial issues of Wojtyla’s papacy: the I.O.R. scandal in the beginning of the 80s, the pedophilia of the clergy cover-up, Legionaries of Christ’s founder Marcial Maciel scandal, and so on. Many ride the wave of the Ratzinger icon opposed to his predecessor one. There are several common sentences: Ratzinger cleans up what became dirty under Wojtyla’s pontificate; Wojtyla was not very fond of managing the Church, Ratzinger is doing it. Ratzinger is a “Pope less brought to the media”, while Wojtyla was a Pope at ease on the stage of the world. Common sentences, and nothing more. The spiritual link between the two Popes was more than strong. Rome, 1976. Cardinal Karol Wojtyla is called to preach Lent Spiritual Exercises to Roman Curia. The topic of his preaching is: «Christ, sign of contradiction». It is a sign of contradiction in the Eastern Europe, where atheism aroused to be a political system. It is a sign of contradiction in the Western civilization, where people always more do without God, and are disinterested to the Church and the moral of the Church. Christ is also sign of contradiction inside the Church. Karol ask everybody to see inside their hearts. He asks it to the prelate of the Curia as well as to powerful man, magnates. Reading his words, one cannot be stricken by the fact that, at a certain point, Wojtyla quotes “Introduction to Christianity”, by Joseph Ratzinger. Ratzinger never abandoned the topic of Christ sign of contradiction. He made of it the pivot of his pontificate. He is in perfect continuity with his beloved predecessor. Several times, on the other hand, Wojtyla called him “the faithful friend”. They lived in symbiosis. Cardinal Tarcisio Bertone, now Secretary of State but formerly secretary of Congregation for the Doctrine of the Faith, discredits – in a book he just published to celebrate John Paul II Beatification, Un cuore grande (Libreria Editrice Vaticana) – the *black legend* about a conservative Joseph Ratzinger who wrote Dominus Jesus, the declaration on the unicitiy and salvific universality of Jesus Christ and the Church. Wojtyla himself wanted this declaration to be written – Bertone explained – in order to create no confusion among religion and no danger of religious syncretism. It’s the same line followed by Benedict XVI. That’s why the next meeting among religions for peace in Assisi is organized by Congregation for the Doctrine of the Faith, the Congregation for the Divine Cult and the Secretary of State. Going on opposing John Paul II and Benedict XVI seems stupid. The top of the Church always changes, and new Popes will be elected. But everything is in the middle – the grey eminences – never change. Grey eminences move their pieces to one or to the other part to make their own game. Did the things really change? Actually, while time passes by, things simply are managed in a different way, and that’s the only visible change. Former centers of power need to stay apart, and act in the shadows. When a new Pope is elected, grey eminences need to decide if going in favor or against the new top. The Pope is always left alone in managing the Church, and is subjected to blackmail. In September 2009, Il Giornale, an Italian newspaper owned by Berlusconi’s family, attacked Dino Boffo, director of Avvenire, the newspaper of the Italian Episcopal Conference, guilty of criticizing the moral behavior of the President of Council while being sentenced for harassment in the past. The source of the newspaper was a tissue came from a “person you should institutionally trust”, said Vittorio Feltri, at that time director of Il Giornale. It was the same tissue that for years passed from hand to hand at Istituto Toniolo, the “strongbox” of Catholic university – who raises great part of the funding for Catholic culture in Italy – since Dino Boffo had been nominated in its board. It was the typical issue the Secretary of State hand for its internal dossiers. Many interpreted it as a signal, since Sodano was losing influence inside the I.O.R., the Vatican Bank, since the man he nominated as a prelate, mons. Piero Pioppo, was appointed nuncio to Cameroon and a new president had been nominated, Ettore Gotti Tedeschi. Now, cardinal Sodano is presenting himself as the best ally of Joseph Ratzinger. As dean of the College of Cardinals, in the spite of the priestly pedophilia scandal the last year, during the Easter Mass, pronounced a speech in which defended Benedict XVI doings from what he called «idle chatter». Right before the beatification, many Italian medias wrote about a letter by cardinal Sodano, in which he explained his decision not to testify for Wojtyla’s beatification. The same choice had been done from Cardinal Sandri, a faithful companion to cardinal Sodano. A few days before the beatification, it was asked to cardinal Angelo Amato, prefect of the Congregation for the Cause of the Saints, the reasons of this choice. He replied that the Positio contains the testimony of both the cardinals. Why are there these two differing reports? 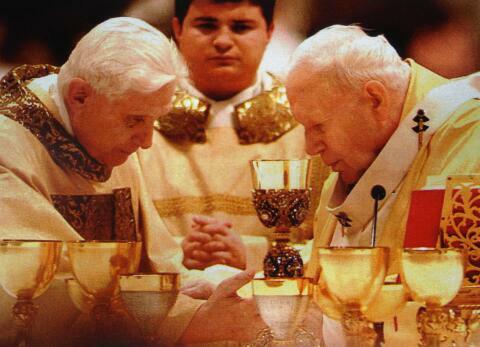 This is just an example, one of the hidden signs of continuity between John Paul II and Benedict XVI pontificates. Many tell that several grey eminences (cardinals, bishops and so on) still meets – almost once a month – with their faithful companions. They still manage the power. But the lot of guiding the Church fell to Benedict XVI.